"Ichiro Suzuki #51 of the Seattle Mariners warms up before batting against the Washington Nationals at Nationals Park on June 22, 2011 in Washington, DC. The Washington Nationals won, 2-1." My eyes couldn't help but to see and make features between action when I was recently covering the string of baseball games in Washington, DC. 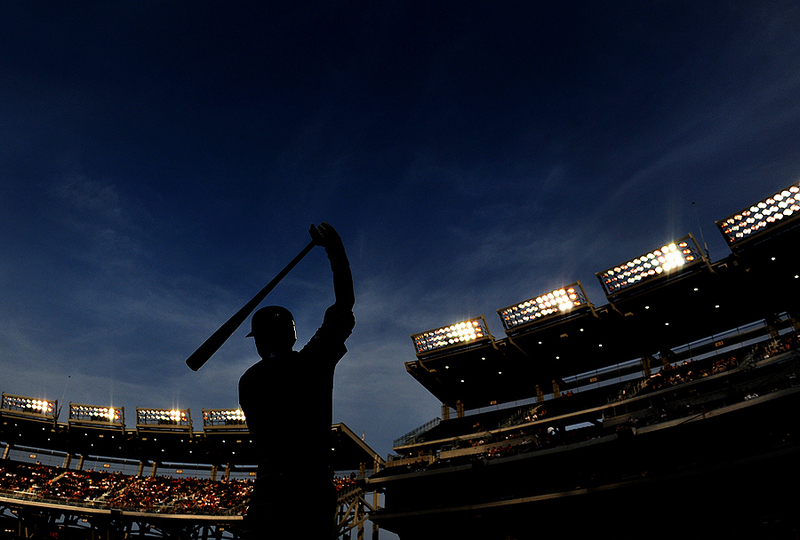 The major perk to shooting at Nationals Park is the abundance of room and the inside photo wells. Not every stadium I've shot at has the inside photo spots, and even during high school and college coverage, it can be literally impossible to make any sort of on deck or close dugout photos. So as the sun set, I waited for an all-star to make their way to the plate. Just so happen to be Ichiro Suzuki of the Seattle Mariners as the day light slowly faded into night over the crowd. Managed to reach out of the inside well and compose a couple frames blindly. While this is nothing more than graphic art that doesn't tell the story of the game, it's a good bit of color that I think could be used for future stories and such. It is kirei - or beautiful - in Japanese. Really Awesome shot, as are the previous ones you posted up there. Wow, nice image. Artistic and iconic.